The story of how computers invaded the homes and cultural life of 1980s Britain. How did computers invade the homes and cultural life of 1980s Britain? Remember the ZX Spectrum? Ever have a go at programming with its stretchy rubber keys? How about the BBC Micro, Acorn Electron, or Commodore 64? Did you marvel at the immense galaxies of Elite, master digital kung-fu in Way of the Exploding Fist or lose yourself in the surreal caverns of Manic Miner? For anyone who was a kid in the 1980s, these iconic computer brands are the stuff of legend. 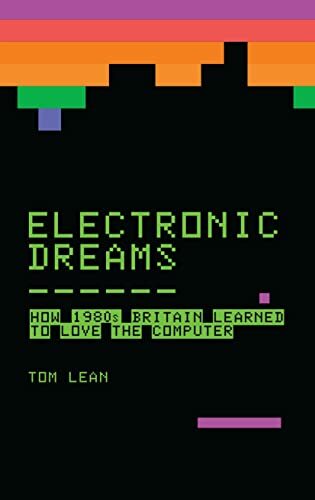 In Electronic Dreams, Tom Lean tells the story of how computers invaded British homes for the first time, as people set aside their worries of electronic brains and Big Brother and embraced the wonder-technology of the 1980s. This book charts the history of the rise and fall of the home computer, the family of futuristic and quirky machines that took computing from the realm of science and science fiction to being a user-friendly domestic technology. It is a tale of unexpected consequences, when the machines that parents bought to help their kids with homework ended up giving birth to the video games industry, and of unrealised ambitions, like the ahead-of-its-time Prestel network that first put the British home online but failed to change the world. Ultimately, it's the story of the people who made the boom happen, the inventors and entrepreneurs like Clive Sinclair and Alan Sugar seeking new markets, bedroom programmers and computer hackers, and the millions of everyday folk who bought in to the electronic dream and let the computer into their lives.